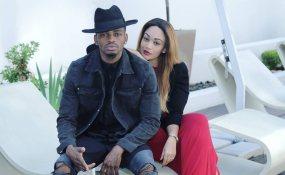 Diamond Platinumz's relationship with socialite partner Zari Hassan seems to be on the rock again, following the emergence of fresh allegations of the musician cheating on her with former Big Brother Africa winner Dillish Mathews. For a couple of days now, words have been going round that Diamond, while on a trip to Zanzibar to shoot a new song, linked up with the 2013 BBA winner and even ended up having a one night stand. One of Diamond's handlers, Kifesi, posted a picture of Diamond taking a big swim in Zanzibar Indian Ocean supposedly while in the company of Dillish who wasn't pictured. An irritated Zari commented on the picture with a 'middle finger' emoji. A fan later engaged Zari sympathizing with her current situation that comes barely after Diamond was accused again of fathering a child with model Hamisa Mobeto. "If Diamond was serious with you, he would have married you by now after giving him 2 kids. Now after Hamisa he has gone to Dillish. Just young women, maybe he is just after Ivan's property that you have. No matter how good you look, he will always look for young p***y." Zari replied the post by saying: "@Kwasi Kojo honey there is so much D… out there just like there is so much p***y out there. A frustrated Zari later on took to her Snapchat account and continued trolling her baby daddy. Interestingly, it is the same Dillish who was in the middle of Kenyan singer Avril break up with her ex South African fiancé Muga.